As many of you know, I've owned and solved all of the Revomaze Series One puzzles released, including the Gold puzzle, which I'll write about soon. 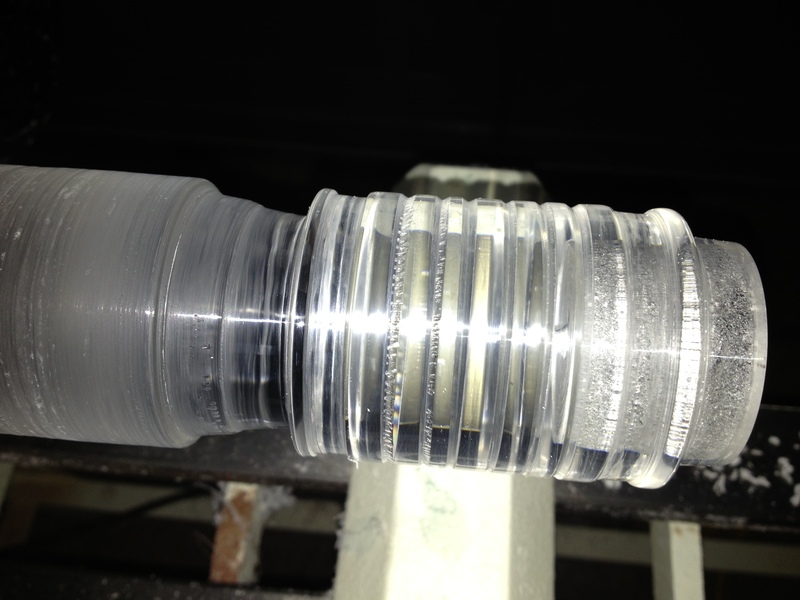 For a long time on the Revomaze Forums, a clear sleeve which would allow you to see the maze as you solved it has been talked about and many people have asked for one. 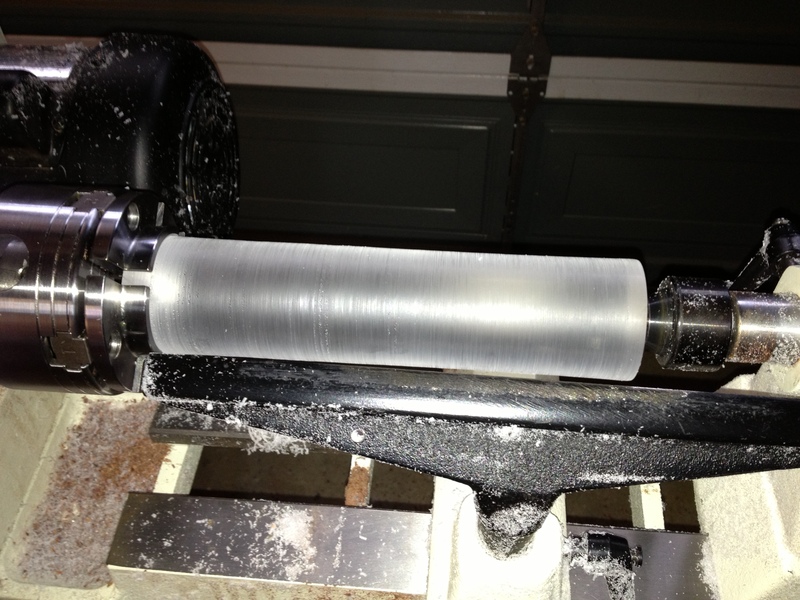 Well having added the lathe to my list of tools, I thought I'd have a shot at making one. Since getting the lathe, I've made a few pens, some bowls, all just learning how to use the tools, and get the shapes I want made. I mostly work with wood, as that's where my real love is, however I have played with a few acrylics as well. I find the acrylic to be a pain to work with, since it tends to create thin streamers of plastic which just wrap around whatever you're working on, and obscures your view of the work. Still, there's no way I could make a clear sleeve from wood. Clear sleeve starting point. A 2"x2"x8" block of Acrylic. 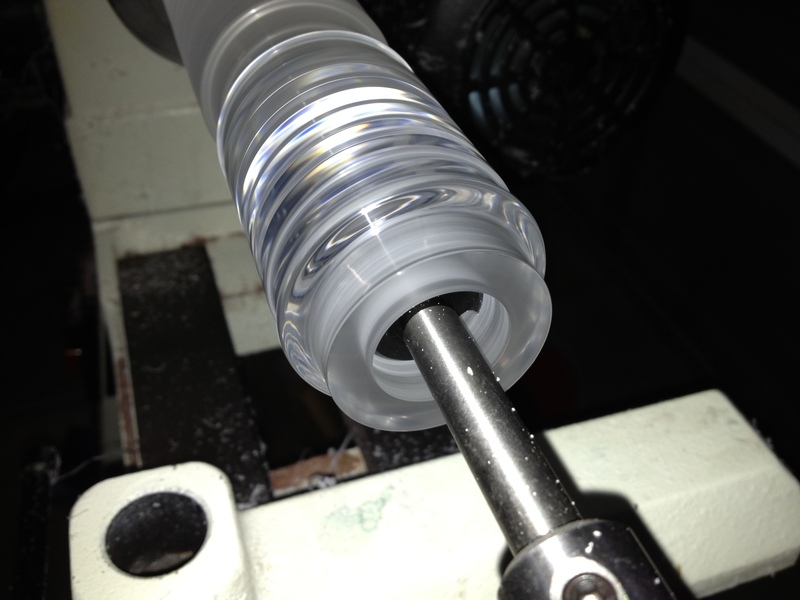 It all starts with a block of clear acrylic. This piece is 2"x2"x8", which will be enough to make two sleeves. 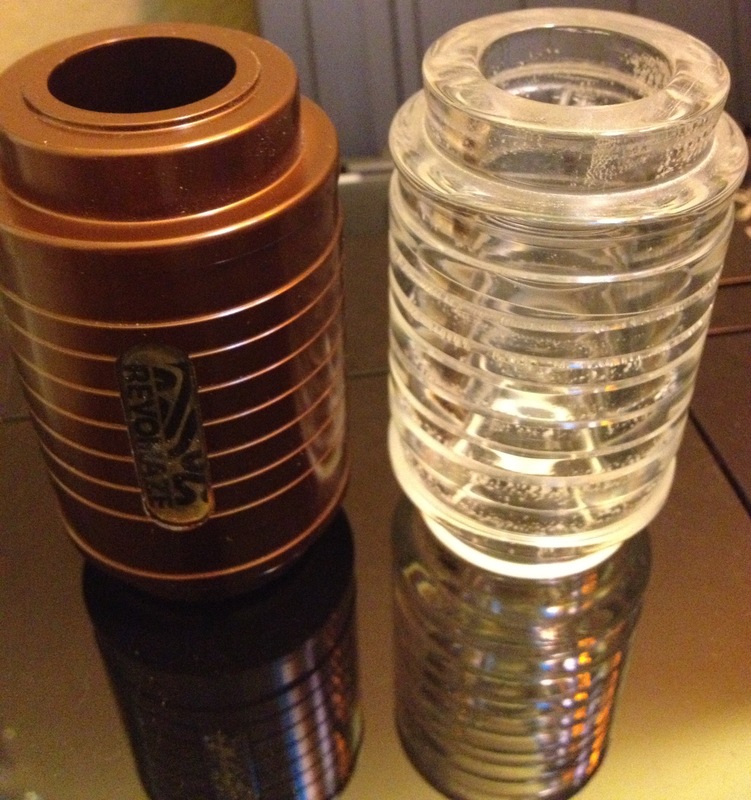 I got it from Tap Plastics here in the bay area. They'll custom cut sheets while you wait, and their prices are pretty good. I'm no expert with the plastics, but I can certainly recommend them. The block turned to a cylinder. First up, I need to take this perfectly clear block, and make a complete mess of it; otherwise known as turning it round. Doing that removes the beautiful clear finish, and turns the whole thing a rather cloudy opaque grey colour. When I'm working with Acrylics, I need to wear my respirator, as the smell created when working it tends to give me a headache. Not bad practice anyway, but something I have found I have to do. As it turns out, I'm also somewhat allergic to the material too. 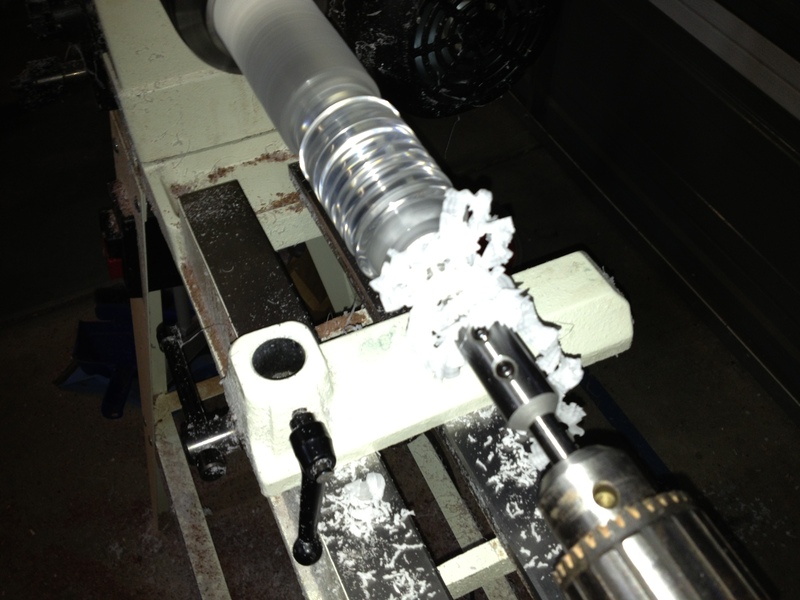 When I'd finished turning the block into a cylinder, and brushed all the tiny shavings off my arms, I found that I'd reacted rather badly to it. Time for a shower and some anti-histamine! 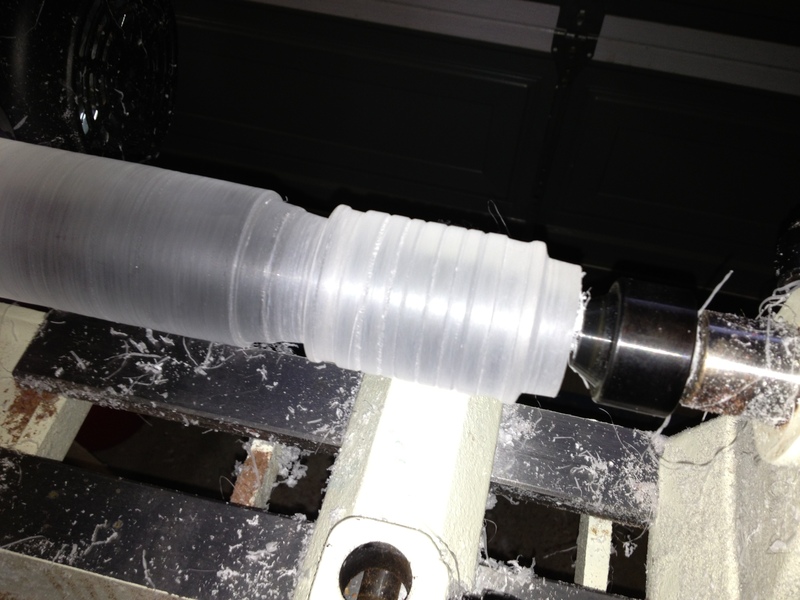 Having cleaned up, and put on long sleeves, I came back and shaped the outer surface of what would become the sleeve. Using the sleeve from my bronze maze as a template I matched the dimensions as closely as possible, including the ridges along the main body of the sleeve, and of course, making sure that the length was exact, since the intent is to make a fully functioning sleeve. At this point, I've kept the sleeve attached to the main piece of perspex as I still need to drill out the central hole where the shaft will be. Before I go and drill that out though, I want to get the clear finish back so that I can see what I'm doing when drilling things. Outer surface sanded to 12000 grit. After around half an hour of work, I end up with the finish above. This is wet sanded all the way up to 12000 grit to give a finish close to how the block arrived. 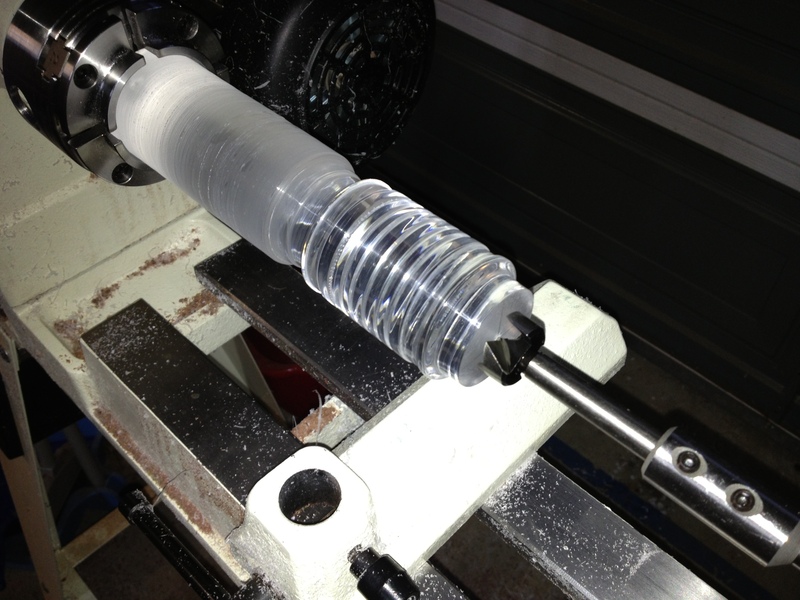 With that done, and the cylinder being transparent again it's time to change our the tail stock on the lathe for a 15/16" forstner bit to drill out the hole in the sleeve. Given the length of the hole I was drilling, the drill bit alone wasn't going to be long enough to make the cut. I had bought a bit extender so that I'd be able to drill the length I needed. 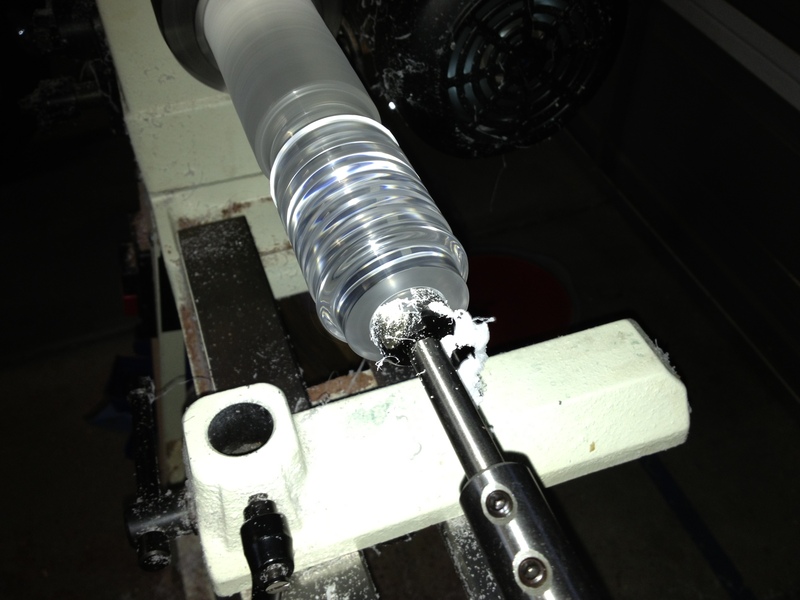 As you can see, with a sharp bit, the cut creates long streamers at the beginning of the cut, but before long, the heat almost melts the acrylic, and you have to be careful to eject the shavings before they solidify behind the head of the drill bit, and make it impossible to remove the drill bit. Even though the drill leaves a rough surface on the inside of the sleeve, given the work sanding it earlier, it looks really good. Once the entire core is drilled out, it will be sanded up to 12000 grit the same as the outside, before being polished to a high shine. Having completed the drilling of the core, I parted off the sleeve, and finished sanding the ends to get the same finish as the rest of the sleeve, things are just about ready. Some plastic polish is applied, and then a coat of Ren Wax to really finish the shine. As you can see, the inner core isn't perfect, but with more sanding I could get things back to a perfect finish. In fact I've gone back and made a second sleeve without the ridges which is far clearer than this sleeve. 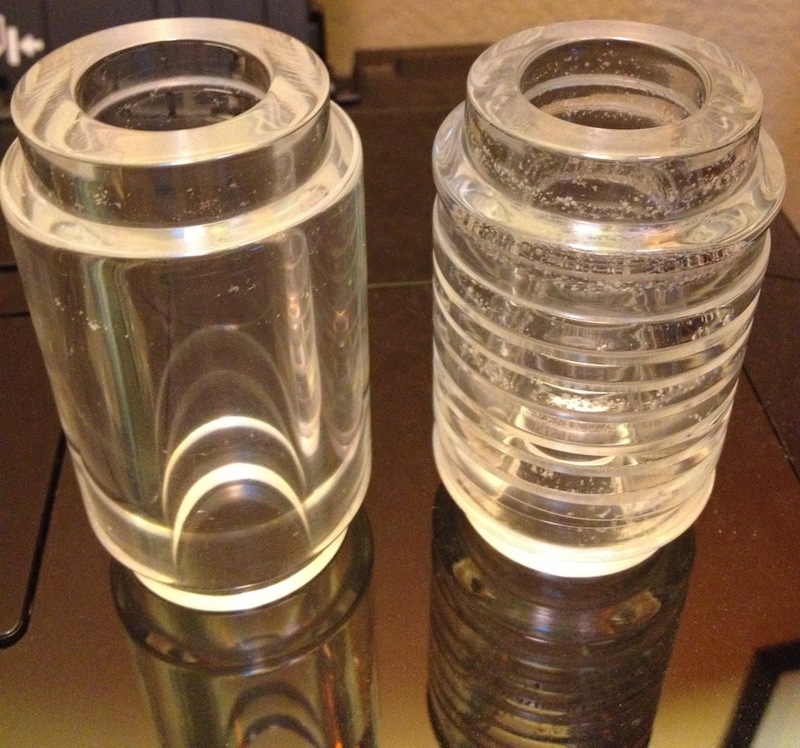 Both clear versions side by side. So the real test is left. Can you see the core? Well the answer is a resounding yes. 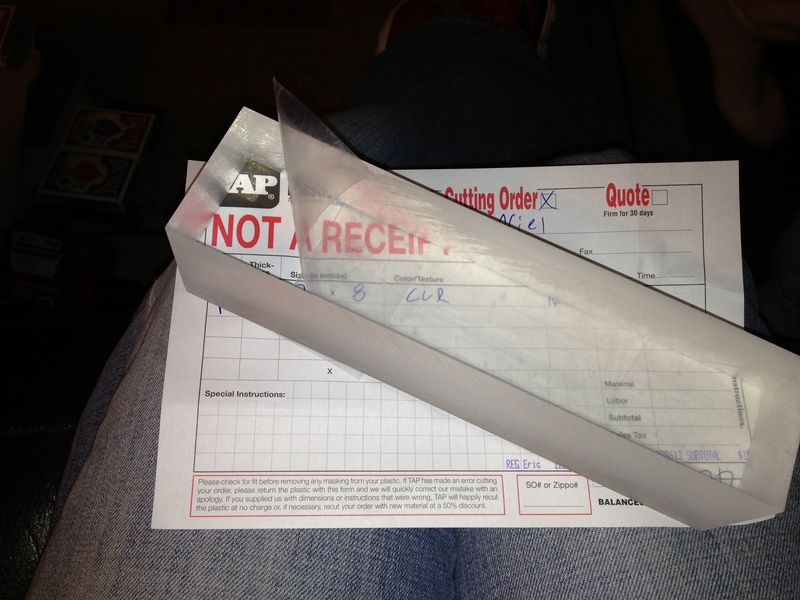 The core is easily visible in the sleeve, and everything fits perfectly. I'm pretty happy with the results. Merry Christmas, and Happy Holidays to all my readers. I have a very special post today from Stickman himself. I'm very proud to be able to bring you the Constellation Puzzlechest. 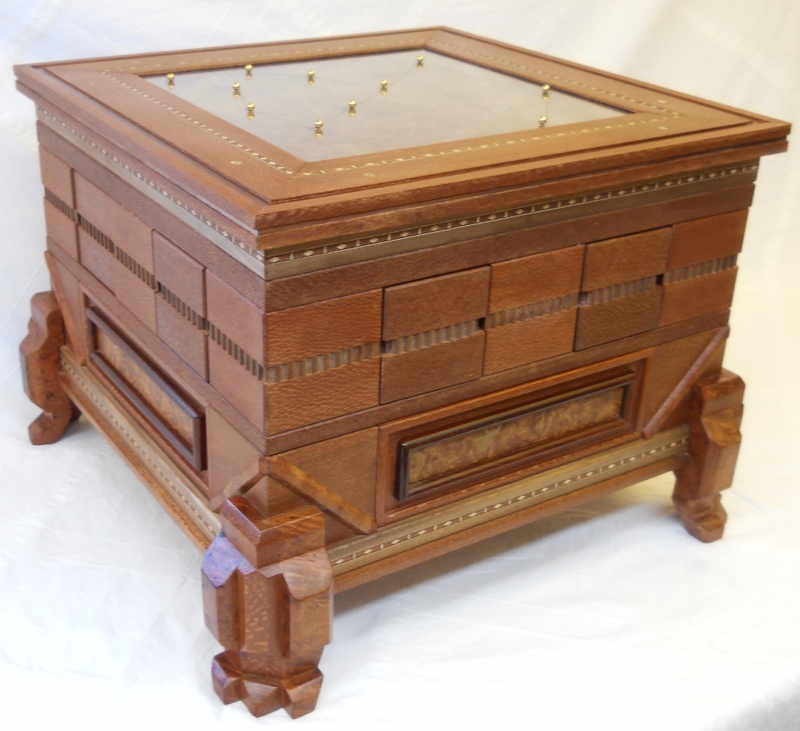 This beautiful chest is his latest creation, and is a one-off commissioned piece. The rest of the post comes directly from Stickman. There are various photos throughout and a video at the bottom of the page, all supplied by Stickman. I hope you enjoy this sneak peak. 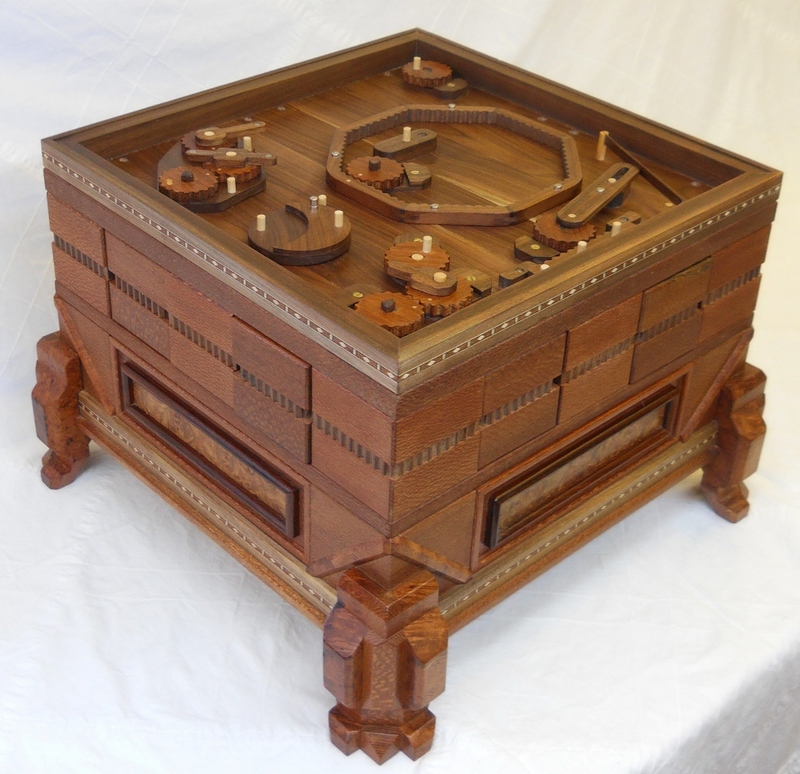 The chest houses a total of 16 small puzzleboxes, each of which may appear identical, but are unique in their solution. Inside each of these is a single mechanical part. It requires logical deduction to determine just where each of these must be placed in order to make the chest’s mechanism operate. Stickman Constellation Puzzlechest mechanism parts. Once completed, this mechanism will operate by pushing drawers into the chest. 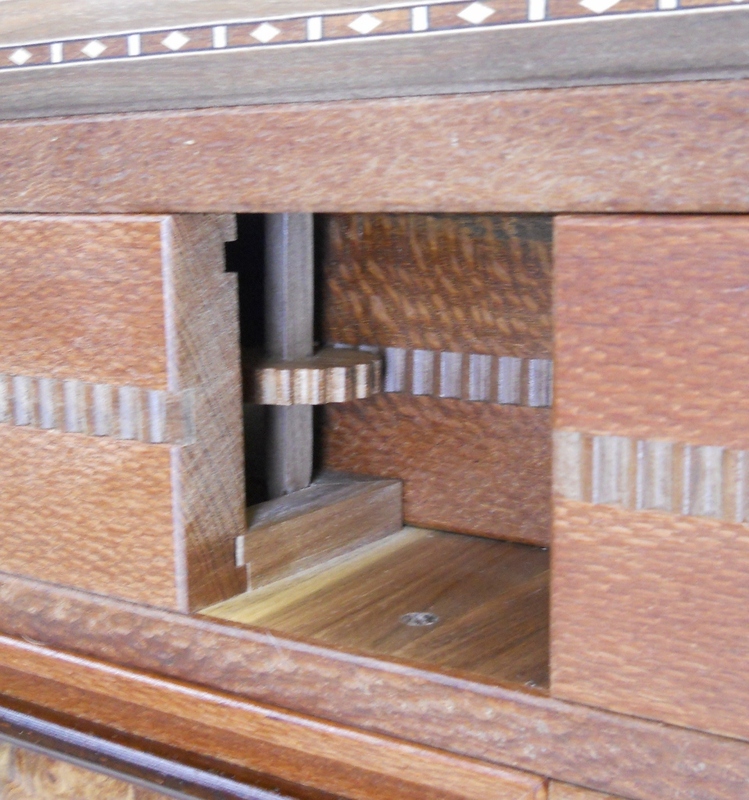 Decorative inlays on their sides engage and rotate internal wooden gears, and pushing in one drawer will cause another one to come out of some other side (and not always the side you expect). The sequence in which puzzleboxes are pushed into different openings is key to manipulating the mechanism properly. Constant Gear Mesh with the internal mechanism. The patterns of celestial constellations are etched on both sides of the chest’s lid. Place gold magnetic spheres (representing stars) on the lid and magnets embedded in the mechanics below move and rotate them until they line up with these etched celestial patterns. This is not as easy as it seems though, as the operation of some components influenced output of others. Once this is accomplished, one of the two hidden drawers of this chest will open. Flipping over the lid to solve the puzzle for a second constellation will unlock another secret drawer. I have been a fan of Jean Claude Constantin's work for a while. Many of his designs are laser cut pieces which press together making for some very characteristic 'Constantin' looking designs and almost all of his puzzles have some unique and interesting mechanic that makes them worth owning. Radbox is another design which is a classic laser cut puzzle box design with some striking features which makes it really stand out. I got my copy from Puzzle Master. As you can see from the image above, the design is quite striking. 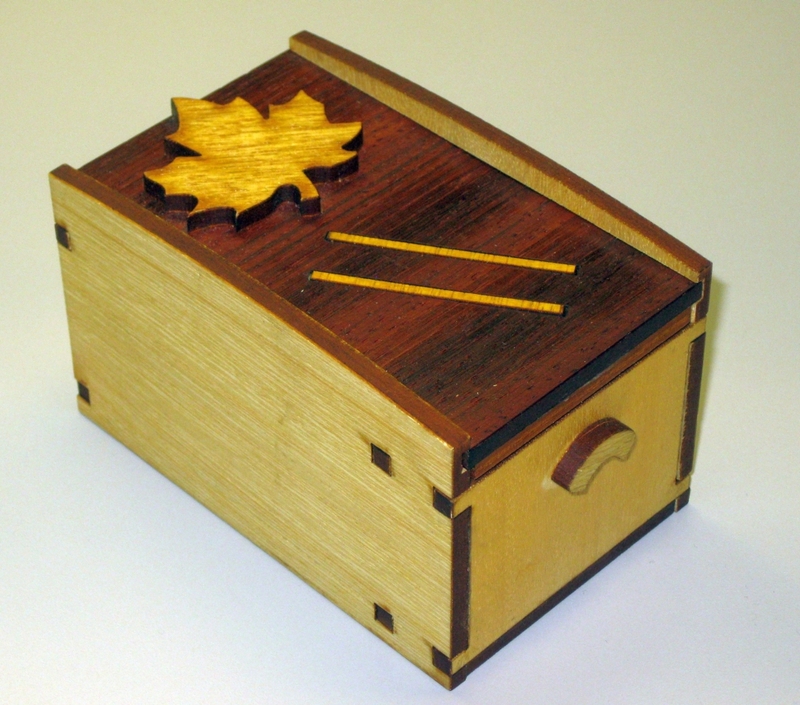 The Maple panels, Paduak top with Maple leaf and banded Maple insets really looks good. If you have any misconceptions that laser cut puzzles are 'cheap' or somehow 'low quality' then this box is a good example to prove that as a false statement. There are a lot of really nice design choices such as the gentle curve on the top of the side panels and the curved handles on the sides which don't change the mechanism of the puzzle, but really help to finish the puzzle. At 4.5" x 2.75" x 2.5", the box is a good size, and has very little reduction in inner dimensions so you'll be able to store something around the size of two packs of playing cards inside. Examining the box you'll quickly see that at one end there is a peg attached to the sliding lid, and at the other you can see something curved at the other end, which all together stops the lid moving more than a new millimeters. Shaking the box, there's a slight rattling, and spinning or blowing on it doesn't seem to do much to move the lid any further. Some careful examination will lead to some discoveries about how the locking mechanism works, before making you realise that you may not have fully understood what's going on as the box remains resolutely shut. The mechanism is simple yet clever and once you understand how it works, you can open the box repeatedly and fairly quickly. Although it is similar to mechanisms I've seen in other boxes, it does take the idea one step further making it worth a look. Overall a fun box, and great value if you can get your hands on one. Several months back, I received a copy of "You and Mona Lisa", a Mirrorkal puzzle, designed by Ivan Moskovich and produced by Recent Toys. So why has it taken me so long to write about it? Well truth be told it's taken me this long to solve it! The puzzle is an interesting variation on the 15 puzzle, with this version having 9 tiles, plus the space needed to move the tiles which is conveniently placed off to the side of the puzzle. What makes the puzzle unique and quite so challenging is that the image you see when looking at the puzzle is being reflected by an angled mirror from an adjacent piece. The goal, as with any other 15 puzzle is to scramble the tiles, and then restore the original order so you can see the picture of the Mona Lisa. 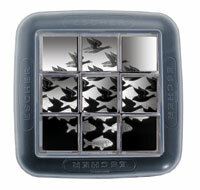 The earlier version of the Mirrorkal Puzzle was a removable block version where the nine puzzle pieces were stored in a frame. 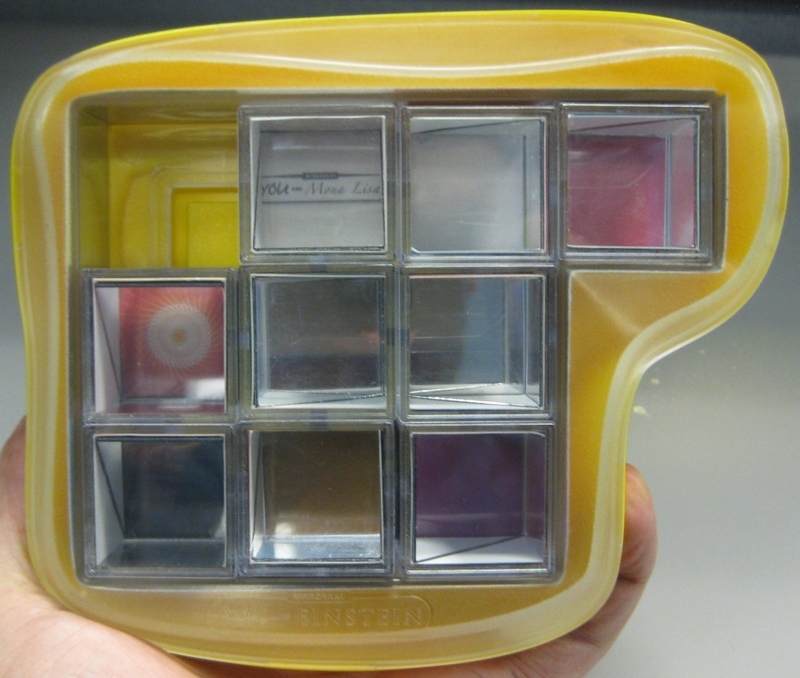 In that version you are able to remove the cubes and inspect each side, allowing you to match the correct side with the corresponding mirror to make up the solution. With the sliding tile version, things are much more challenging. Since the cubes can't be removed, you will have to either position the side of the cube you want to see with the empty space adjacent to it, or place it in the centre and surround it with mirrors pointing at the cube, to allow all sides to be seen. Having done this you'll need to remember what picture is where, and then position each tile in the correct location to make the final image. Oh and if that's not enough of a challenge, remember that since you're dealing with mirrors, the images are upside down on the sides of the cubes! If you'd like more information on the Mirrorkal Escher, Brian and Gabriel have both written about it. 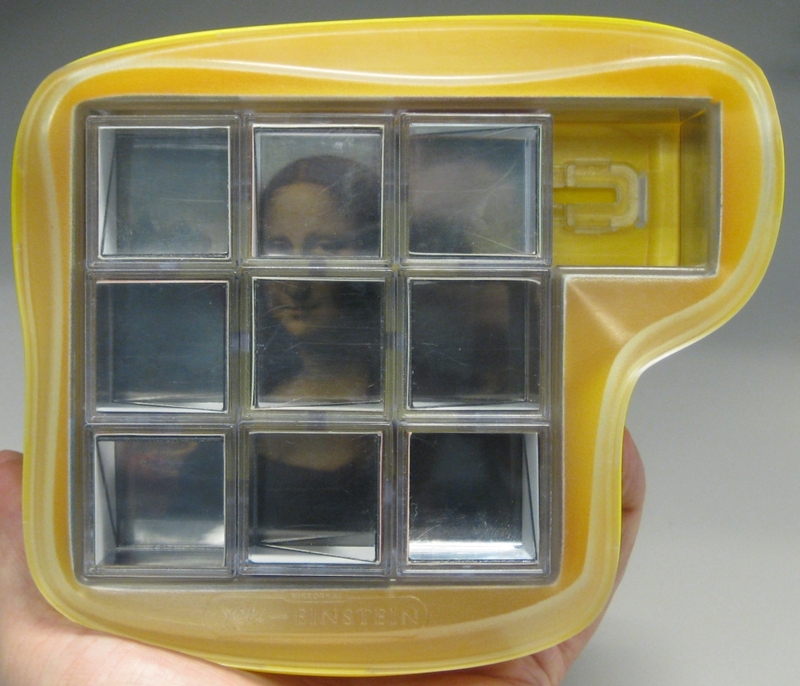 As you can see, once the puzzle pieces are scrambled, in most cases they no longer show parts of the Mona Lisa image, making the challenge even more difficult. Something else which you need to take into account is that there may be more that one cube with the same a part of the final image on it, so not only do you need to find the parts of the image, and place them in the correct spot to be reflected by the adjacent mirror, but the piece you've identified may not even be the correct one. This happened to me where I was trying to place the last two cubes, and they were swapped from where they needed to be. It turned out that I needed the other piece with the same angled mirror, which I'd already placed in the opposite corner. Mirrorkal - "You and Einstein"
As an interesting note, the 15 style version of the puzzle originally used an image of Einstein, but was later changed to the Mona Lisa. The workings of the puzzle is still the same, just the images which were swapped. In fact if you look at the frame of the puzzle, it still reads "You and Einstein". 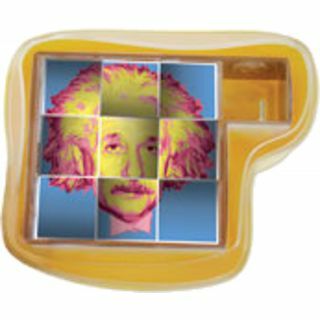 Puzzle Master still has copies of the puzzle with the original Einstein image if you'd like that version. Whether you're looking for the slightly harder challenge of the sliding tile version or a simpler puzzle with the framed cubes, both versions of the puzzle are well worth picking up and I can highly recommend them. These would make great stocking fillers, although you may need fairly big stockings! For some more thoughts on the Mirrorkal - "You and Mona Lisa" puzzle, Gabriel's Review has some more thoughts. Note: Sorry about the poor images in the review. Given the mirrors in the puzzle, it's not easy to photograph. The Cerebral Rings puzzle is an interesting plastic puzzle produced by Magnif. My copy came to me from Puzzle Master in the last shipment of puzzles I had arrive from them. This was a puzzle I was interested to play with as it seemed rather different than many I'd played with recently, and I hoped would be a nice change of pace. 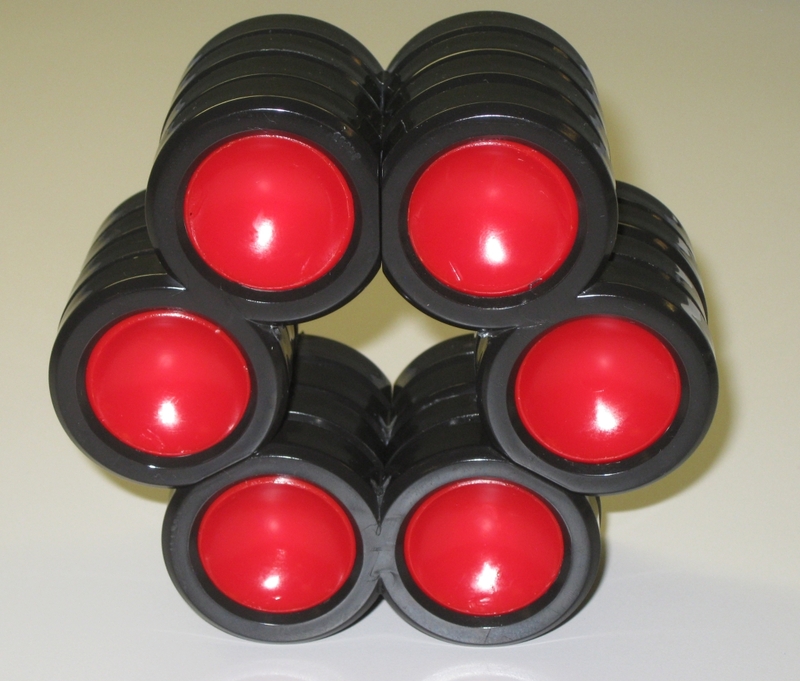 The goal of the puzzle is to move the red plungers inside the circular shafts to positions where it will allow the black rings to slide apart in a coordinate motion, separating the three parts which make up the rings. Measuring 4" wide x 1.75" high the puzzle is a good size and the plastics used have been well finished to give a really glossy appearance as you can see in the photographs. All the edges are nicely chamfered and the curves used in the plungers mean that they are comfortable to press when you're playing with the puzzle. The fit of the pieces is good, making it difficult to see the seams where the three frame sections join. One downside which I have to mention about this puzzle is that the inside of the tubes have been coated fairly heavily with a lubricant. 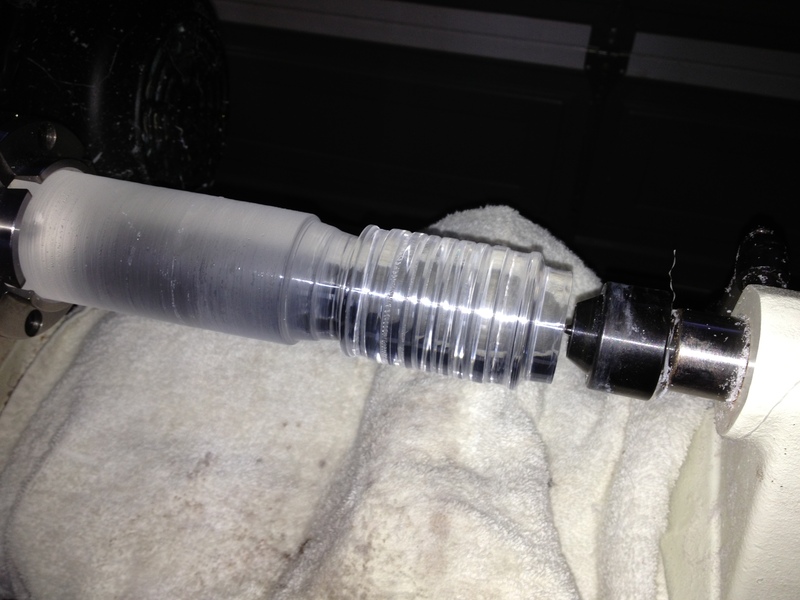 Clearly the idea was to make the pieces move easily inside the tubes. 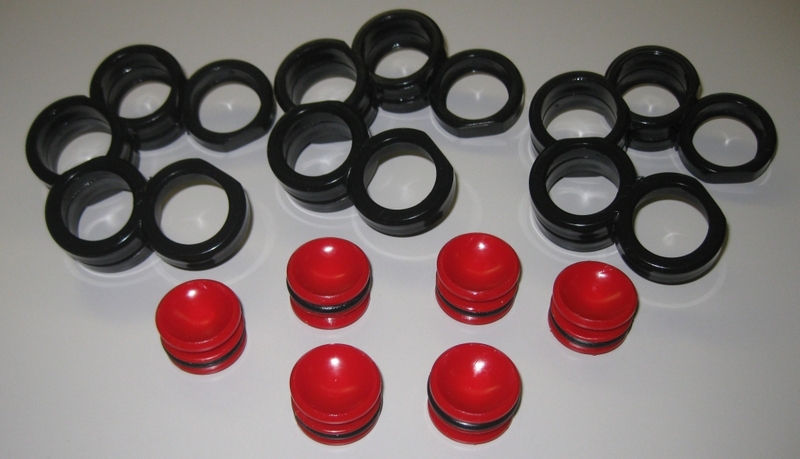 Unfortunately, at least on my copy the amount of grease used was excessive, and then you push the red plungers inside the tubes, your fingers end up covered in grease, making for a fairly unpleasant experience when playing with the puzzle. The first thing I did when I opened the puzzle was to take a rag and clean out all that grease. 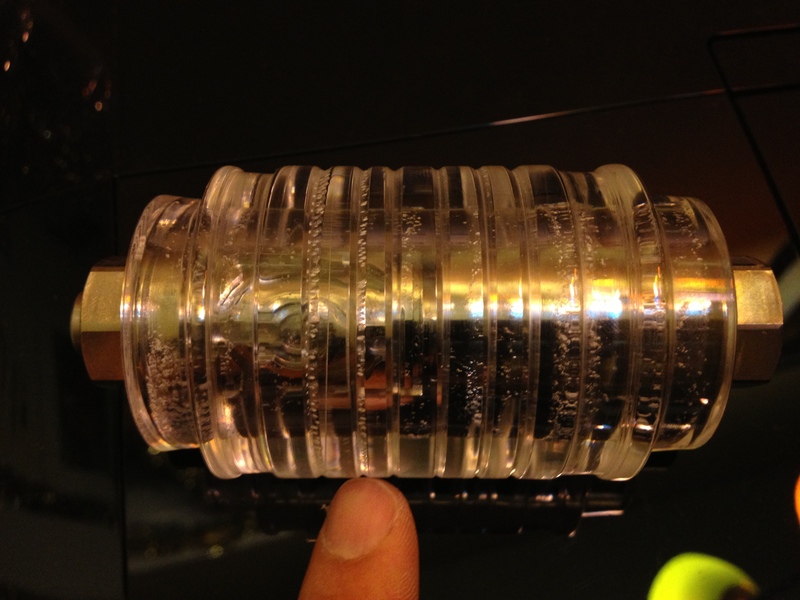 Sadly even with all the grease in there to start with I found there were times when the plungers would get stuck in the tubes and require significant force to move them past the obstacle which they were stuck on, allowing full travel through the tube. From the Manif website, the puzzle comes with the following description: "Fabled to have been found among the effects of the renowned astronomer Johannes Kepler, was an early version of the Cerebral Rings. This challenging puzzle baffles astronomers, astrologers and mathematicians alike. It was said that Kepler’s students had to master the expanding layers of the Cerebral Rings and the red plungers within, solving the puzzle in order to progress to apprenticeship. There are hundreds of possible combinations and only 8 solutions." Personally I think Kepler would be turning in his grave at the idea that the puzzle was used as part of an apprenticeship, as the puzzle really isn't that challenging, however it makes for a good story! It is true that depending on how you count a move, there may be hundreds of combinations, and only eight solutions, but sadly once you've found one, there's really no need to find any others, as there's not enough of a difference to make it worthwhile. That said there are some nice elegant symmetrical solutions if you care to look for them. As you can see once you've found the correct combination, the rings slide apart passing each other in a coordinate motion which means that they do indeed expand as they come apart. The fit of the pieces is very good here, so starting the motion can be quite a challenge. Finding the correct spot to push on the pieces so that they glide past each other is not obvious, and as with many puzzles, placing your fingers so that you're not blocking the motion can be tricky. Puzzle Master rates the puzzle as level 8/10 (Demanding) and Manif rates it 2/4. I have to say I think it's closer to the lower end of the scale but could certainly provide a good challenge if you're not paying attention. I enjoyed playing with the puzzle even if it did take a very short time for me top solve it the first time, somewhere under 5 minutes. It was a good change of pace to the other puzzles I've been playing with recently and would make a good Christmas present for the younger puzzler. 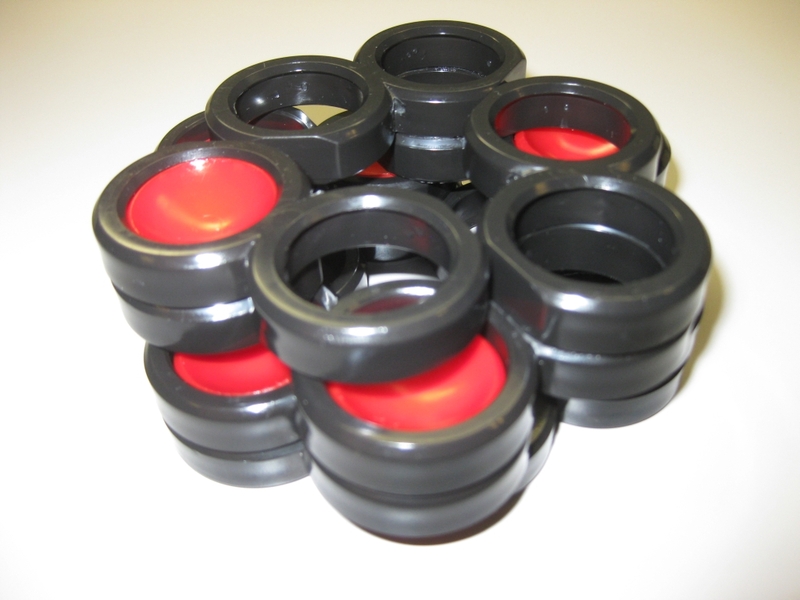 Once you've solved the puzzle everything comes apart, leaving you with the six plungers, and three black ring sections. The rings are all identical so re-assembly is fairly simple. Overall a fun distraction even though it's not an overly challenging puzzle. 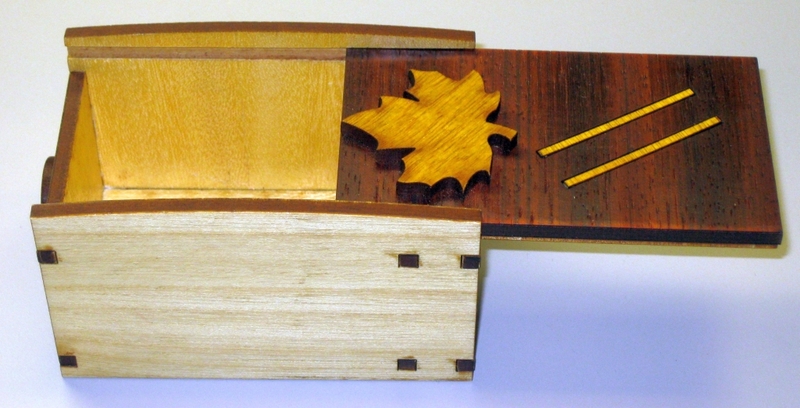 It is well made, and the contrasting colours will make it stand out on the puzzle shelf. Definitely one that people will pick up and have a fiddle with. 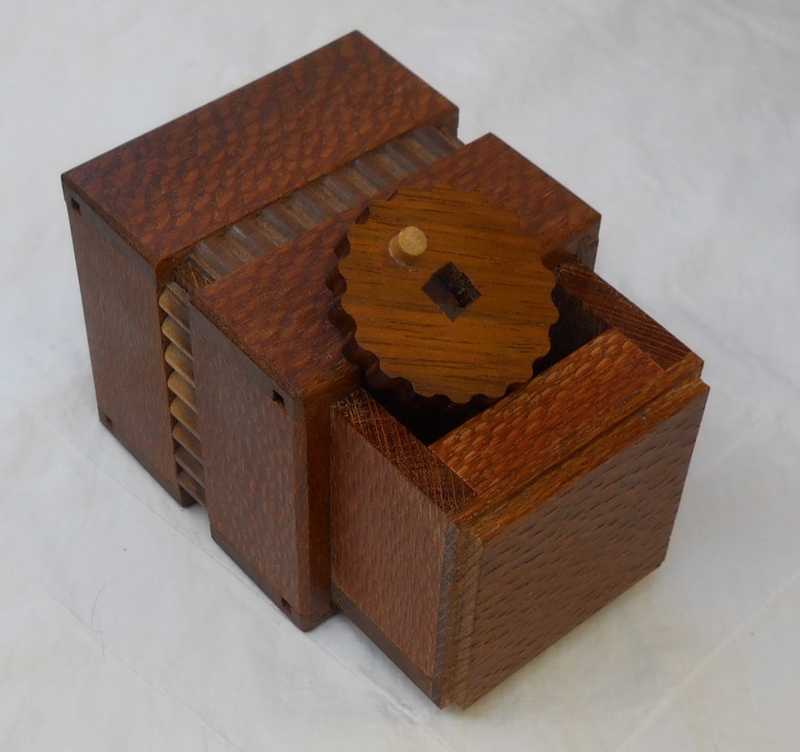 I've written about many cube based puzzles on my blog, including my journey into the making of a number of cube based puzzles, but so far they are all made from wood. 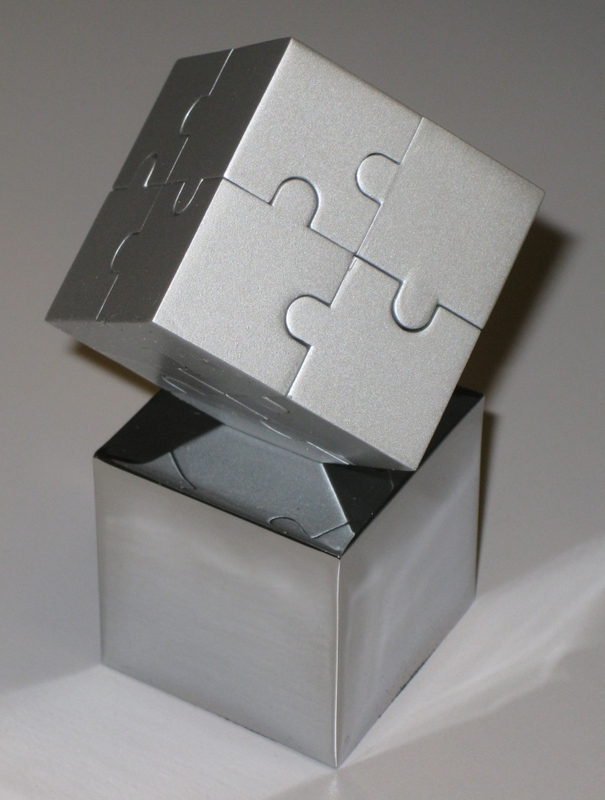 The Cube Puzzle, or Jigsaw Cube is an eight piece metal puzzle made by Inform designs. This is the first metal cube in my collection and given that it's been sitting on my desk for long enough it's probably about time I wrote about it. I received my copy from Puzzle Master. The goal of the puzzle is to take apart the cube, and restore it to its original configuration. As you can see from the photograph, the puzzle comes with a chrome stand to display it, making it a perfect object for your desk at work. 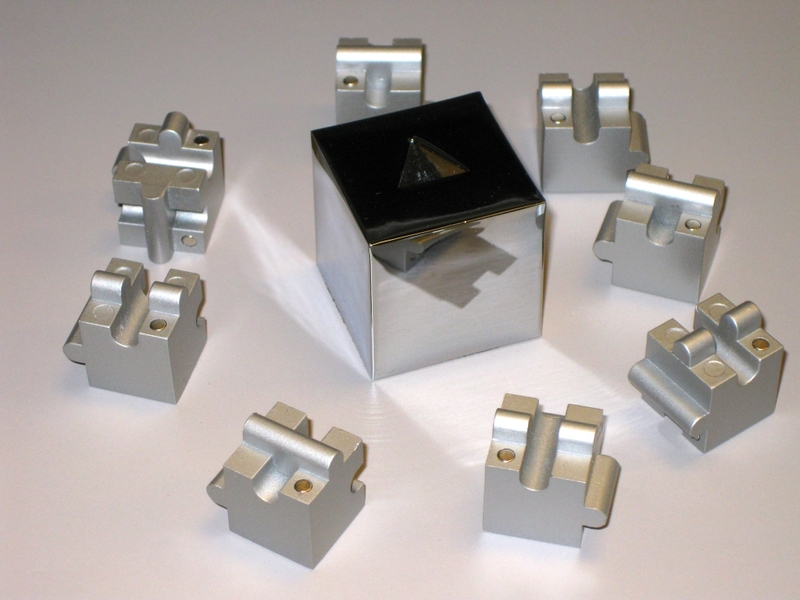 The Matt finish to the puzzle pieces sets it off well against the highly polished base, and the notch cut into the top of the stand allowing the cube to be displayed either flat on the top, or balanced on one corner really adds to the effect. Measuring in at 1.5" x 1.5" 1.5" with an identical sized stand the puzzle is a reasonably good size to play with, and being solid has a good weight to it as well. 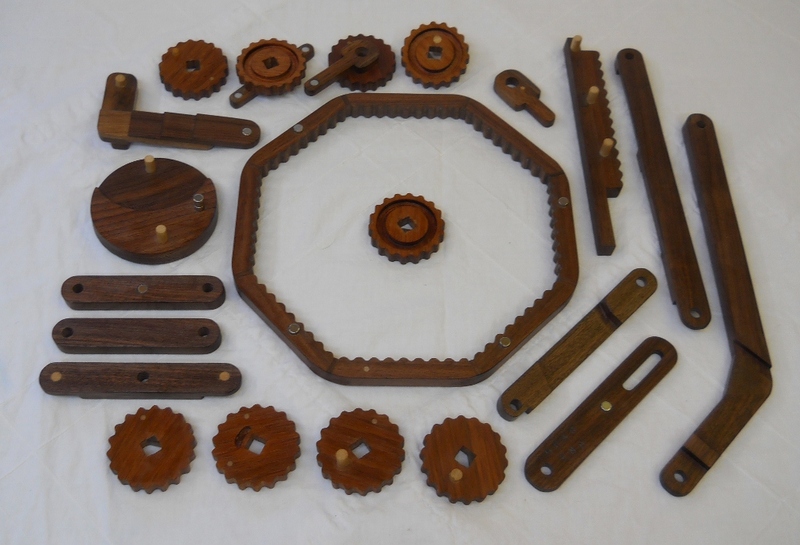 The puzzle itself consists of eight pieces with varying ridges and troughs cut into them, giving the assembled puzzle the appearance of Jigsaw puzzle pieces. 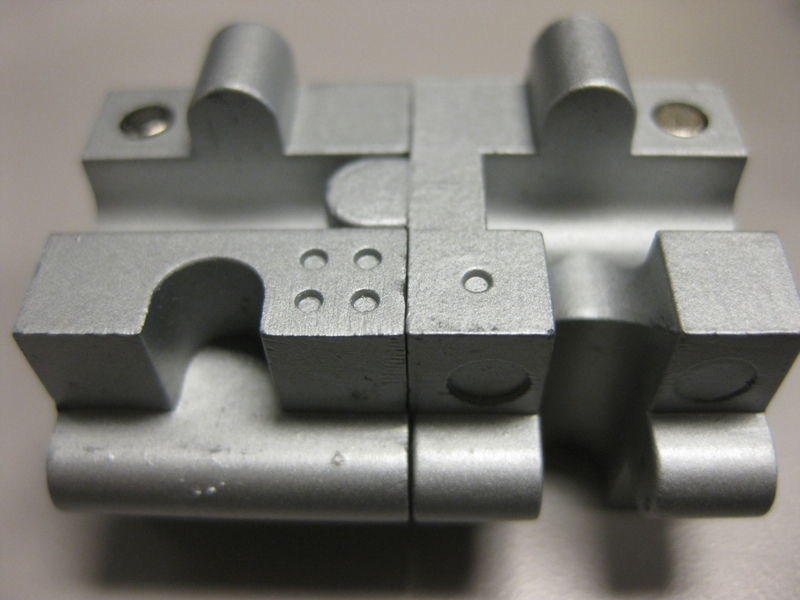 There are a number of small magnets placed in the corners of a number of the pieces which help hold the puzzle in its solution shape. In my case, one of the magnets was not glued in place, so fell out when I opened the puzzle. Not a big issue, and a little CA glue soon sorted the problem out. The magnets themselves play virtually no part in the solution of the puzzle as the polarity is the same on all pieces with the exception of one corner, so any almost piece will 'stick' to any other. Looking at the pieces there are two sets of identical pieces, so this greatly reduces the possible orientations that the puzzle can be put together and makes it much easier to solve. Unfortunately that's not the only drawback to this puzzle. 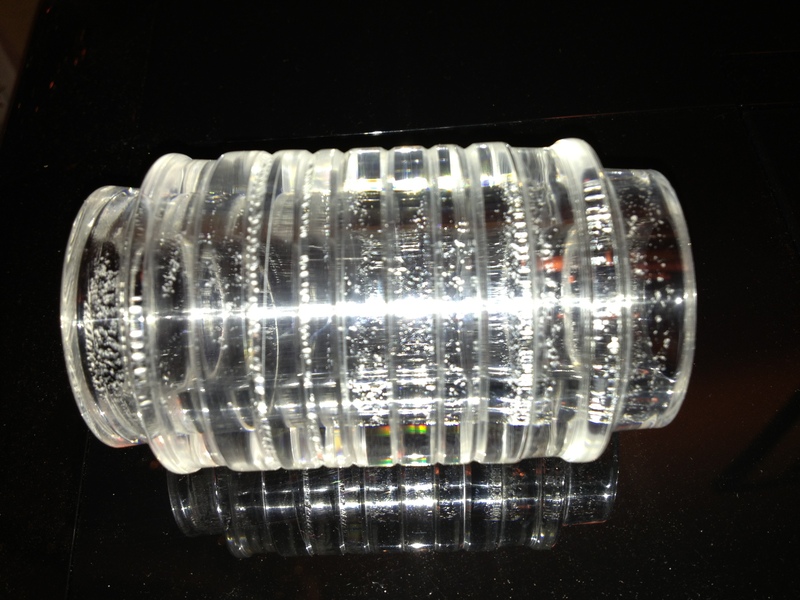 On each piece there are a number of dots engraved on the piece. This gives an order to putting the pieces together, and are rather difficult to miss. For me this really detracts from the puzzle, and makes it almost impossible to solve it without 'cheating'. Even without looking at the included solution it is almost a given that the markings will influence any attempt you have to solve it. Overall, this is a very well made puzzle, and looks great. For me though, the engraving really detracts from the puzzle and makes me thing this is one to pass on, unless you want a simple gift that's going to look great sitting on the desk of a puzzle enthusiast in your life. If Inform designs read this, consider removing those markings from the mold, and you'll have a much better puzzle! For another view about this puzzle, have a look at what Oli said over here.